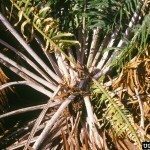 How do you generate new leaf growth on my Sago Palms? Try giving the plant some fertilizer. A standard slow-realease fertilizer is normally recoemmended for these plants.